Above, Dr. James B. Beard as I remember him. Below, “Cat” [our name for him!] who died at around the age of 15 on Saturday, June 2, 2018. In over fifty years of writing and broadcasting (radio and TV) on gardening and horticultural topics, I never dwelled on turf (or grass) that much. I did try to keep up with what was new and exciting and only occasionally attended any of the many conferences where “the experts” presented papers on the topic. One such conference I did attend occurred back in the mid-80s in Toronto when the Turfgrass Symposium was too close to me to even think about missing it. The keynote speaker at the conference was Dr. James B. Beard then working out of Texas A&M University in College Station, Texas. I well remember taking some short notes during his lecture that day in Toronto. One of the topics he covered that day was the work of a fellow scientist, Dr. Bruce Ames whom I had followed for several decades. Bruce was at that time working on finding out and comparing what the average U.S. citizen’s diet contained in comparison to how much or how many pesticide chemicals eaten by the same person. His findings, later published showed that the average American digested more natural chemicals from vegetables, than the same person would eat in a full lifetime of exposure to pesticides. Dr. 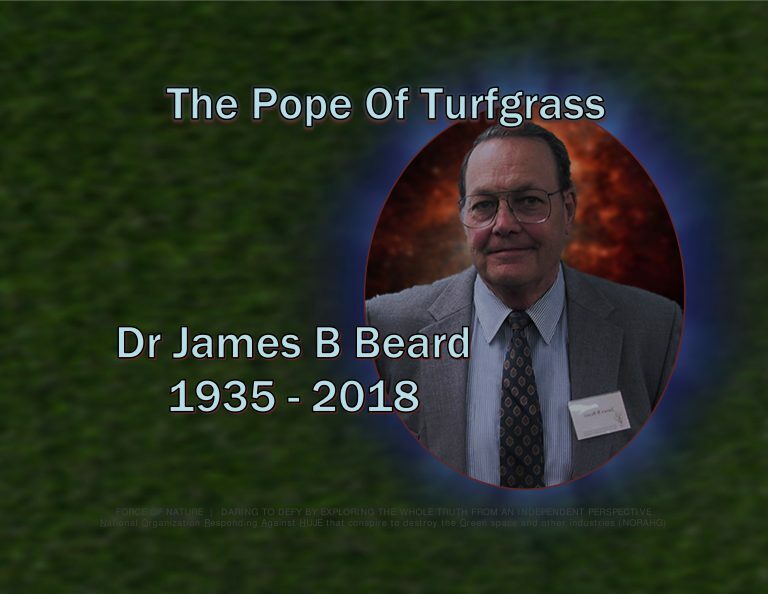 Beard was a legendary icon, hero of the green space industry, and tireless researcher and author dedicated to the advancement of turfgrass science. He touched the professional lives of tens of thousands of turfgrass managers, researchers, and educators throughout the world. Dr. Beard meticulously researched books and publications that served as priceless information for the turfgrass industry. His books became bibles for generations of turf maintenance professionals. He was the author of best-selling bibles » like Turfgrass : Science and Culture and Turf Management for Golf Courses. His personal library, known as The Beard Collection, has been generally acknowledged to be the finest compilation of turf-related material in existence. The Beard Collection is now archived at Michigan State University with a recognition as the strongest public repository of turfgrass literature in the world. Dr. 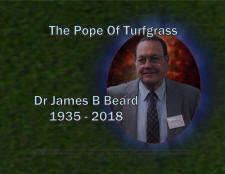 Beard was one of the truly great pioneers of turfgrass management and a legendary icon. The students of Dr. James B. Beard, PhD, had a name for him. According to Johnny Walker, Golf Course Superintendents Association of America (GCSAA) South Central field staff representative “We used to call him The Pope Of Turfgrass.” His mind was always working on the next research project and was so interested in what made the plant work. Dr. Beard was considered a pioneer in turfgrass science, and spent much of his career at universities, including Michigan State and Texas A&M, which is where Walker studied under him. A native of Bradford, Ohio, Dr. Beard authored numerous works, including the famed Turfgrass : Science and Culture in 1973, Turf Management for Golf Courses, and 2004’s Beard’s Turfgrass Encyclopedia for Golf Courses, Grounds, Lawns, Sports Fields. Dr. Beard, who wrote hundreds of peer-reviewed and technical papers, donated his collection of turfgrass research materials in 2003 to the Turfgrass Information Center at Michigan State University, where he taught from 1961 to 1975. To conclude this piece I’ll leave you with one other fact that James Beard imparted to us in Toronto over 30 years ago—this story from the beginning of his speech (the former quote was from the end of the speech). He began by reporting that trees in general require much more water than does grass. Then he told the story of a woman in Denver, Colorado who won the prize for water conservation in that city by spearheading a city by-law banning the use of Kentucky Bluegrasses in all home lawns but urging the planting of trees by homeowners.